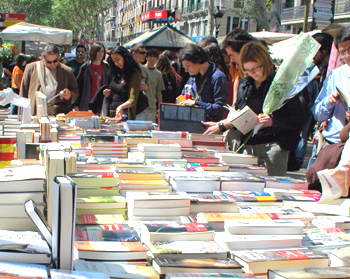 What Exactly is Sant Jordi Day? The story (although there are several variations) goes something like this: The King of Lasia (a fictional city) had to give up his daughter, a princess called Sabra to appease a hungry dragon that lived nearby. 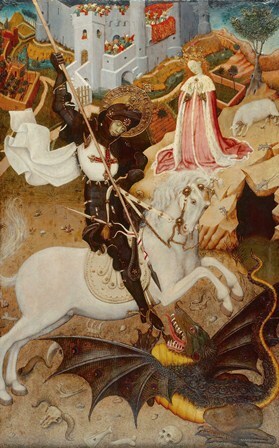 Saint George, whom by chance was in the vicinity came to the princess’ rescue and slayed the dragon with his sword or spear (something sharp in any case). From the blood of the slaughtered dragon, a rose emerged, and that is why the rose motif is ever-present on this day to celebrate his chivalrousness and love for the princess. A great allegorical work of wonder paying homage to Saint George is Antoni Gaudí’s own Casa Batlló; a modernist building whose facade is littered with rich symbolism depicting the Saint´s defeat of the scaly dragon. Saint George (a.k.a Sant Jordi) is the Patron Saint of the region of Cataluña. Here, the Day of Lovers - or as locals call it - La Diada de Sant Jordi, is reminiscent of Saint Valentine’s Day - as couple’s stroll through the streets and love is in the Spring air. And, as tradition suggests or requires, its all up to your interpretation, presents are to be exchanged between lovers and loved ones, and often even between colleagues every April 23rd. The typical gift is a rose for woman and a book for man. Ah yes, love and literacy, heart and mind, two complimentary elements if you ask me. Take a walk around and you will be surprised at the sheer number of makeshift rose stands and bookstalls that seem to dot ever corner, sidewalk and nook and cranny of the city. You need a rose? You’ll surely find one anywhere you go. Interestingly enough, and although the holiday originates back to medieval times - the idea of exchanging books started coming to fruition in the late-1920s. The reason? Crafty booksellers that pushed the idea of giving a book as a gift in honor of two literary greats, William Shakespeare and Miguel de Cervantes, whom both ironically died on the same day of the same year: April 23, 1616. Due to this, some cafes and book shops hold readings by important local and international authors. Many Catalans play hooky from work or school that day and playfully take to the streets to wander about. At night, as one can imagine, restaurants are packed as couples enjoy a romantic dinner in the warm Spring evening. It’s all lovely love here on this fine day. 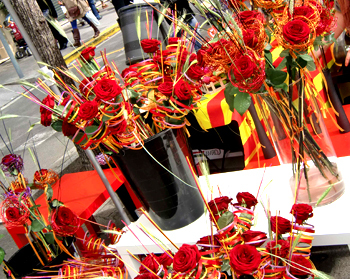 Feliz Sant Jordi!